Recommended for reuse up to 10 times. Manufactured from BPA-free polypropylene, Sterifeed reusable 250ml bottles will fit market leading breast pump flanges such as Medela and Ameda. Sterifeed breast milk bottles are a convenient alternative to freezer bags, are easy to handle and transport. Storing milk in small containers reduces waste, especially when frozen milk is thawed. 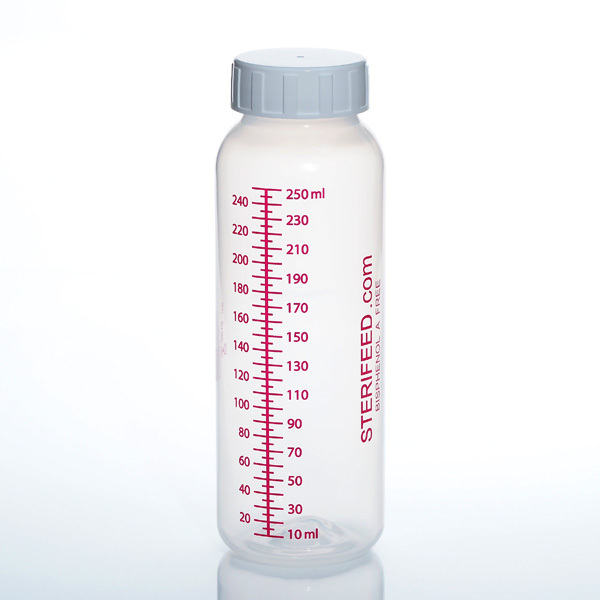 Sterifeed 250ml bottles (14190) may be reused following careful sterilisation. The recommended method is cold-water sterilisation tank, using Milton or similar sterilising liquid. Also suitable for most electric steam sterilisers. Do not microwave this product.